Summertime is a fun time for vacations, baseball games, hikes with your dogs, and weekend getaways. It is also time for those working companions to keep busy moving cattle on the summer range. As you make plans to head outside with your pets, there are several ways to keep them from overheating. Heat Stroke is a potentially deadly state where the pet’s body cannot keep its body temperature in a normal range due to outside conditions or exercise. Heat exhaustion is an emergency that requires immediate treatment. Dogs do not tolerate high temperatures as well as humans do because they do not sweat as we do. Dogs depend on panting to exchange warm air for cool air. When panting isn’t enough, your pet’s body temperature begins to rise and this condition can be fatal if not corrected quickly. Short nosed breeds such as Boxers, Bulldogs, Pugs and Pekinese cannot exchange air as efficiently as other breeds and when the weather is hot they may experience difficulties easier than other breeds. Older dogs or those with health issues are more apt to experience heat difficulties. Prevention of heat stroke will help keep your pet safe. Do not leave your pets outdoors when it is hot without adequate shade and cool water. Dog runs and tie outs for dogs can be a hazard when the sun changes position and the shade moves or disappears completely. You may have to provide a shade tarp or umbrella, a small wading pool filled with water, misters or extra tubs of water. Do not leave your dog in a car, even with the windows rolled down while you run into a store for something as it can be fatal. The inside temperature in a car on a warm day as well as on an overcast day can quickly rise to a deadly degree. If you must be out and about with your pets during hot weather, make sure you bring plenty of water and some shade with you. Take a water break in the shade every 15 minutes for at least 5 minutes at a time when you are hiking. When you will be walking on hot sand, concrete, or asphalt your dog’s feet can blister so go to those areas in the early morning when the surface is more likely to be cooler. 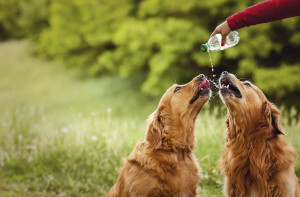 If your dog is working in warm weather, be prepared to offer him water at regular intervals and understand that he may drink more water than usual under these circumstances. Wipe his groin, belly and legs with a cool, damp cloth or spray with a water bottle to help cool him when you take a water break. Become aware of your dog’s behavior and know what is abnormal. It is important to know when you pet might be overheating. Rapid, sometimes frantic panting (the tongue extended much further than normal and may be scooped at the end like a big spoon with slimy drool at the tip), increased heart rate and temperature, difficulty breathing, restlessness or listlessness, excess salivation, vomiting or diarrhea, or dark red tongue and gums are some of the first symptoms you may notice. As the symptoms progress you will see an even higher increase in your pet’s body temperature, weakness, staggering, gasping, seizures, and gums may turn purple or blue. If you believe your dog is suffering from heat exhaustion, immediate emergency measures are required. Emergency measures to cool your pet must begin at once. Move your pet out of the source of heat. Begin rapid cooling by spraying the dog with a garden hose or immersing him for up to 2 minutes in a tub of cool water then placing the dog in front of a fan. (Very small dogs should be immersed in lukewarm water.) Towels soaked in cool water can be used to cover your dog. You can also place damp towels between his legs and across his neck and on top of his head. Do not use cold water or ice. The normal rectal temperature for a dog is between 100 and 103 degrees. Once your pet’s temperature has fallen below 104 degrees stop the cooling process and dry the dog with a towel. Following an episode of heat stroke, take your dog to a veterinarian as soon as possible. Heat stroke may result in breathing problems that need further treatment. Program your veterinarian’s emergency contact information into your phone for quick access. Other consequences of heat stroke include kidney failure, irregular heartbeat, and seizures. These complications can occur hours or days later. Prevention and knowledge of your pet’s normal behavior along with being prepared will help you enjoy the outdoors with your pet all summer long. If you have further questions regarding heat stroke or other summer related issues, please contact our Rexburg animal hospital at (208) 356-4271 for further information.